Im going to give a brief overview of how to create more space, cut down on everything in your closet and make use of more of your clothes. Wouldn’t it be amazing if our wardrobes looked clean and neat like this? So once you have gotten rid of everything that’s not currently in season, go through all your clothing for the current season and try it on, decide if you like it, if it suits and when last you wore it. If you are unsure of any of these then it is most probably best to get rid of it. I will write a separate section below on best places to recycle. Hopefully you have done a good job of whittling down the wardrobe. Now separate everything in the hanging wardrobe into categories, eg. dresses, jeans, trousers, blouses, skirts. Once in their categories sort again into lengths and then into colours. So maxi dresses together, mini dresses together, long sleeved blouses, short sleeved blouses, then once that is done, all the whites together, all the blues and so on. Separate your jeans into day jeans, and evening jeans and then day jeans into distressed, skinny, flares and colour code as well. Now for the folded stuff. If you have open shelving then you are lucky as it’s easier to see everything, however if you have a chest of drawers it can be really difficult to see and get to things, especially if the drawers are deep. So the best solution is to roll your t-shirts or if you have more time fold them so the fronts (as in pictures or prints) are on the fold in the middle (see example below) for this packing solution. This way you can see everything and wont pull out half the pile whilst trying to grab something from the bottom. With your hanging wardrobe you really need to ensure you have not squashed your clothes in, not only are you unable to see anything but its really damaging to your clothes and will ruin their shape long before their time is up! make sure you are able to kind of scroll through, there should be space so there is movement when you push hangers across when looking for things. Once you have done this you should find that you wear more of your clothing and vary your outfit combinations more often. What tends to happen when we cant see things is we wear the same top with those burnt orange trousers because we cannot think of any other options, generally because you have no idea what’s in there and because when you are in a rush and you cannot see, you just grab what you know works. Also I know from experience that people opt for their favourite items and wear them over and over, neglecting everything else. It is really not necessary to have a wardrobe bursting at the seams with clothes, you will feel so much happier and probably dress way better if you have less, this gives you room for more purchasing when necessary and remember to recycle and do not hoard!!! Alternatively anywhere in Africa!!!! I love to try and take back old clothes and shoes with me whenever I travel home to South Africa and give them to our domestic worker who either sells them or gives them away in the township. 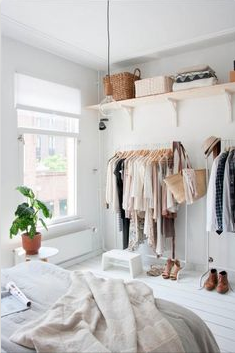 And I leave you with some enviable wardrobes to ogle over, hopefully this will inspire you to get closet clearing! I’m moving out of my dorm room next week and this helped me a lot! Thanks for sharing!